AMDA | AMDA News - Alumna Brooke Bastinelli publishes her second book of poetry! Alumna Brooke Bastinelli publishes her second book of poetry! New York studio program graduate Brooke Bastinelli has just published her second book of poetry, Adust. In it, she bares her soul and grapples with some of the most painful issues one can experience in life. We spoke to her about her days at AMDA and what it took for her to write a book so personal, and how it has changed her life. When did you decide you wanted to be a performer? Was there any specific moment that inspired you? I remember it vividly! I was five in the hallway of my church wearing a red dress and sunglasses. Someone asked me what I wanted to be when I grew up, and I said, “a movie star.” However, my creative pursuits have expanded and I care about doing good, meaningful work in whatever creative outlet I find. But, I always did better as a performer than going about my daily life. I’m at home onstage and a different person. Real life is simply terrifying to me and I’m painfully shy. Performing brings out something open and alive in me. How did you come to AMDA? It was a last minute decision. I was going to go to University of Washington or Western Washington. I had an amazing acting teacher that suggested I audition for AMDA in New York and just see how it goes. I was like, no way am I moving to New York! Not because I didn’t want to, but because I just couldn’t imagine it. When I was accepted, I was hesitant. But my mom said “you have to go or you’ll regret it if you don’t.” This was huge. I’m from Yakima, a really small town in Washington. Let’s just say moving to New York was not the norm. So my mom and dad encouraging me to pursue my dreams was a gift. What was the most important thing you learned while you were here? AMDA could best be summed up as; you get out of it what you put into it. I was thrilled to study in a place where you had all these creative possibilities available to you. I took advantage of auditing as many classes as I could. Sometimes people didn’t want to be my scene partner because I would want to rehearse weekends in the studios. I think it was the type of place that if you were focused and driven, AMDA really gave you room to blossom. Because of that, it taught me to really seek out like minded people with the same tough work ethic. I was pretty young. In fourth grade, I had a teacher that noticed my knack for writing. She sent me to this young author’s conference at a local college. It was a really encouraging thing for her to do. I remember reading my poem and getting notes from a college professor and feeling like a grown up author. In high school, I was very bookish. I hung out in the library with the other kids from poetry club. We would do poetry readings for the club and that’s how I got used to performing my work. This is your second book and you delve into some deeply personal and painful experiences in your poems. When you are acting, in some ways you have the mask of the character to protect you, but in this case you are completely vulnerable in many ways. How difficult is it to expose yourself? It’s really, really difficult. I used to write for myself as an outlet and to perform at poetry readings. But, I wouldn’t write with the intention of publishing. The first book was a compilation of poems I had written. I was just trying to do something with them instead of stuffing them in a box somewhere. With Adust, I had the intention of publishing it. So, it was a different kind of effort. The paradox is, the act of publishing this book is the scariest thing I have ever done. In a play you can blame a bad show on the writing or the director. But in this venture, there is no one to blame. I had a few pep talks with myself saying that people discuss stuff like this in music, and poetry is similar to music. But, the difference is that you don’t even have a drum beat. You are pretty naked. I feel like armed guards are going to show up at my door and take me away because I chose to be so candid. But my main hope with it is that by being vulnerable and real, it will help someone. If my story encourages even one person, then it is worth any kind of criticism I might receive. So while I feel like I’m doing something hard, I’m hoping that, in turn, it will make someone’s journey easier. Art is often transformative, has this been the experience for you writing this book? I’m glad you asked that, because that is exactly what happened. I was in such a dark, dark place while writing this book. It is a place I never, ever want to revisit. I didn’t have any faith in anything or anyone. I had this warrior mentality and was pretty hardened. This book is rough. It’s something you almost have to gear up or be in the mood to read. Like listening to heavy metal or watching one of those really serious Oscar season movies. But now that it is done and out there, I have this optimism and joy flourishing in me. I have started opening up to new themes. Not necessarily light and fluffy but more hopeful, warm, and loving. In writing this out I’ve transformed horror into healing and outreach. I never thought that would happen and it wasn’t my intention. I’ve even started my next book which is about searching for faith. Recently, you performed at AMDA's first alumni cafe. Do you have any upcoming readings? Performing at the café was a huge thing for me. I’m so grateful to have done that. I met a fellow poet there and we are discussing collaborating on creating an evening showcasing female poets. Thank you for speaking with us Brooke. Anyone who discovers your writing will be inspired by your candor, your resilience and the courage to share on such a deep level. About the book: Adust, is a memoir utilizing many forms of the written word to examine personal, cultural and societal struggles while touching on common experiences and searching for collective understanding. Through spoken word, short form poetry, narrative prose, commentary, quotes, and journal entries, Brooke explores themes of loss, class warfare, heartache, surviving sexual assault, and rebuilding. Photography by Cris Kreckler creates a multi-dimensional approach to grappling with the book’s tough questions. How does one survive after loss and violence? Is a new beginning possible after what someone holds most precious to them is destroyed? How does one recover their humanity after injustice? Fusing the personal with the political, Adust illustrates the layers and uncovers the walls surrounding the darkest sides of life. 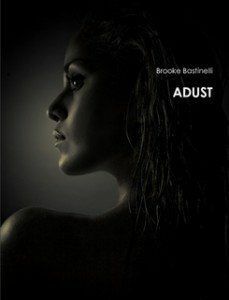 Brooke's book Adust is available on Lulu.